Saturday June 27, 2009 will mark the second attempted barbeque project using the Brinkmann square vertical smoker purchased from the Home Depot. During the previous Saturday June 13, 2009 Brinkmann smoker project significant problems occurred. Mastercool infrared temperature monitoring suggested the Brinkmann smoker failed to reach an appropriate internal temperature for smoking a brisket. Several internet forums devoted to Brinkmann smokers discuss temperature problems in detail. After significant consideration of the problem, the only solution appeared to be modifications to the charcoal pan. A larger number of specially drilled holes in the charcoal pan will allow ash to drop away from the charcoal. Charcoal ash collection will require storing an additional aluminum foil pan inside the smoker under the charcoal pan. In preparation for the project, a combination of spices from the kitchen cabinet built a traditional style Texas brisket rub. After the application of the traditional Texas style rub the brisket will rest carefully packaged in the refrigerator overnight. In the mourning, during the charcoal ignition process the brisket will rest outside the refrigerator returning to room temperature. Developing a deep level of understanding related to the fine art of barbeque will require taking and reviewing notes during the entire June 27, 2009 live blogging session. At some point, the process of utilizing the Brinkmann square vertical smoker will improve. The result of the process will be amazing delicious epicurean adventures into the world of BBQ (barbeque/barbecue). 0640 —– The Brinkmann Smoker is coming up to temperature for the big nine hour brisket smoking session today in Colorado Springs. In preparation of the barbeque session, Joni purchased a digital cooking thermometer/timer from the local hardware store. Acquisition of all brisket temperature data will involve using the digital cooking thermometer. Temperature readings taken from the smoker will involve using the Brinkmann internal thermometer. 0715 —– To keep the charcoal from smothering itself in ash the charcoal pan now has a significant number of holes. Additionally, one of the bottom vents has remained closed to control the airflow across the top/bottom of the charcoal. 0818 —– The Brinkmann Smoker has reached brisket smoking temperature. Only seven more hours of brisket smoking left. Modifications to the charcoal pan have proven to increase the smoking temperature. If the Brinkmann Smoker only reaches an internal temperature of 175, then the brisket will have to be finished in the oven before dinner. 0834 —– Somehow the water pan for the Brinkmann Smoker was almost empty requiring the addition of an entire pitcher of water. Hickory wood has been providing an excellent and consistent smoke. With any luck, this brisket will take on a degree of most excellent flavor. 0945 —– Perhaps now would be a good time to work on developing a new article entitled, “Zen and the fine art of BBQ: How I learned how to stop worrying and love the smoker.” After about three hours, the initial batch of charcoal had diminished. A second round of charcoal briquettes reduced the overall temperature of the smoker, but the brisket temperature remained relatively constant. 1000 —– Can the process of smoking a brisket be defined by a single algorithm? Researchers could easily define the temperature range, timeframe, and fuel supplies as variables. Perhaps at some point this week deriving an algorithm would be a prudent investment of time and energy. 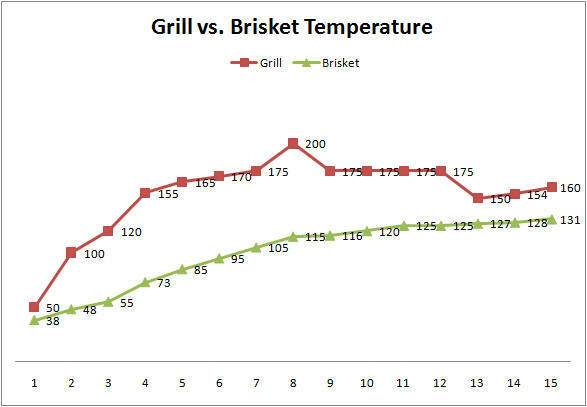 Applied mathematics in this case would allow for numerical optimization of the brisket smoking process. 1100 —– The brisket seems to be smoking correctly. Getting the internal brisket temperature up will probably require removing the water pan toward the very end of the brisket smoking process. Alternatively, completing the brisket smoking could occur within the oven by wrapping the brisket in aluminum foil. Some people strongly advocate finishing briskets in the oven. Andy even advocates completing the brisket cooking process on a traditional Weber kettle style grill. 1135 —– A decision has finally been made about the brisket cooking procedure. At about 1300, the brisket will be removed from the smoker and wrapped in aluminum foil for the oven finishing procedure. Seven hours of smoking will probably give the brisket the desired flavor. 1300 —– Smoking using the Brinkmann is now complete. All of the remaining brisket cooking will occur in the oven. Heavy-duty aluminum foil will ensure the brisket cooking occurs properly. 1600 —– The brisket finished cooking to an internal temperature of 190 degrees Fahrenheit in the oven. The brisket has started the one hour resting process under a towel in the kitchen.